Technology is escalating and mounting every passing hour, every now and then there is some new discovery, a new invention and a new gadget breathing in the airwaves. We are still not sure what this world is heading towards because if we can find water on the Mars, if we can fly over to the moon, if we can climb up to the most highest peaks, if we can capture on the camera lenses the magma sprouting out, if we can do underwater photography, if we can make calls to the farthest areas then anything and almost everything is possible on the planet earth. There is no stopping to the geek-peak of people that even a child of today is carrying a fabulous smartphone in his hands making people envy of its glamor. Technology is racing like a runner in a marathon, it is enhancing the features of all the gadgets and devices with all the more quality and excellence. Who is not accustomed to the highness of Apple, it is the most selling brand across the world that people don’t give it a second thought. It is more like a status symbol to have an iPhone at your disposal in your pocket because it shows your class and that how tidy you are with this classy iPhone. Apple keep on bombarding us each year with surprising launch of new iPhone and this time it is enthralling us with something beautiful yet gorgeous iPhone SE. 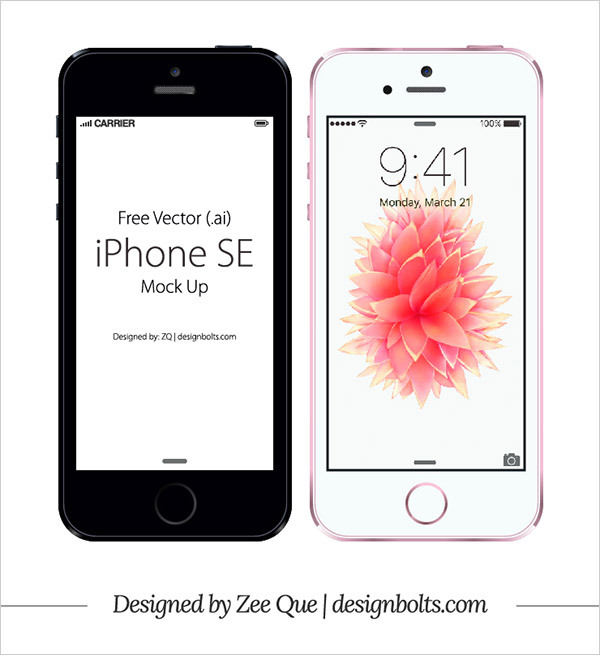 Have a look at free Vector Apple iPhone SE Mock-up. I hope you would love to switch to this new iPhone with the glam up look and revitalized composures. Its fantastic features will give us a boom, certainly a level up to the technology however the Rose Gold exterior is the new edition to the iPhone SE world. I am surely going to buy this because smaller phones look attractive to me. It is a right match for you if you like to avoid big phones. Stay hooked to us because more is yet to come your way tomorrow. Keep a check on every post now once you get the blog subscription. Here we go!